Today’s blog is written jointly with Rachael Rifkin who keeps the blog Family Resemblance (www.lifestoriestoday.com/blog). It’s a lovely tribute to her grandfather, Sidney Goldstein, who was a medic during the Korean War. His wife kept all his letters sent to her during that conflict. Rachael discovered them in the garage. Her blog is dedicated to him and his life. Our work is similar: we both pay tribute to beloved family members who experienced war. My mother, Joan, experienced war on the home front. Rachael’s grandfather, Sidney, experienced it in the field. We would like to pay tribute to both experiences by seeing how Asia appeared to Americans in wartime. Five days before her 16th birthday, Joan hears reports of Japan’s increasing aggression in Asia.
. . . The other day Japan bombed three American ships—one a gunboat—that were in some Chinese harbor and everyone thought there was going to be a war—there wasn’t though, so it’s all right—I hope. In the margin, Joan wrote “Panay bombing.” The Panay was the US gunboat bombed on December 12, 1937. You can view a newsreel Joan sees of the Panay bombing and Japanese incursions into China here. I am fifteen years old. Fifteen years ago I was not, now I am—fifteen years from now—who knows? It gives you a queer feeling—your birthday . . .P.S. Italy and Germany and Japan have a triple alliance now—whatever that means. And the Japanese had a peace assembly at Tokyo this week and are still killing people in China—nice world, isn’t it? Tensions escalate between the West and Japan. Boys she knows may be enlisted and even killed, should war begin. Sunday, February 13, 1938. . . The United States (mine), England and France—the three great democracies as the paper glaringly puts it—sent a note to Japan last week demanding that she cut down on her navies—and yesterday the note came back with an answer—“Go to it—let’s have a naval race”—or to the point. And then Thursday night they had a program on the radio discussing the next war in confident tones. Somehow everything seems to point to 1940 as the turning point—as the time when the climax is reached. Everyone seems sure that there will be a war soon. I was talking to a boy in school Friday about war and death. He seemed sure that there’d be another war (another, oh!) and he said he’d probably be killed in it. All the boys I know will be old enough to die in a war in 1940. When I said, “And afterwards—?”, he said, “Well, if there’s anything to see—afterwards—I’ll see it, and if not, well, I won’t know about it.” Which is, after all, the only thing to say. But think 1940—death—war—oh, why must it be? Finally, Joan’s fears enter her subconscious. She dreams about war in China. I had another dream about war last night—I dreamt that the Chinese and Japanese were fighting and that I and about 50 other neutral people—white—were behind the Chinese lines. The fighting got worse and worse and we decided to go over to the Japanese lines—but the place between was awfully dangerous. I kept saying, “Oh, go on over—we’re sure to die if we stay—we must do something.” And I kept thinking it terribly loud, too. 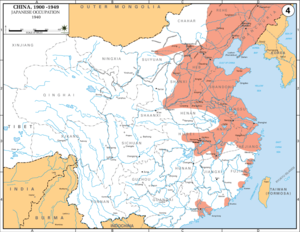 This map shows Japanese incursions into China in 1940; Japanese occupation in red. And I believe I actually was going to do so. But other men were at the end of the line—trying each to be last—wholesale self-sacrifice—and as I watched the dream faded—or at least I can remember no more. I don’t know what happened then. . . .
Then, Pearl Harbor happens. But I’ll tell about Joan’s diary entry on December 7, 1941 another time. You can read another blogpost about the Pacific theater of war and American nurses here. Rachael’s grandfather was also in Asia, but a number of years later. 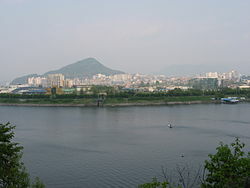 Sidney was there for the Korean War, a conflict that lasted from June 25, 1950 – July 27, 1953. 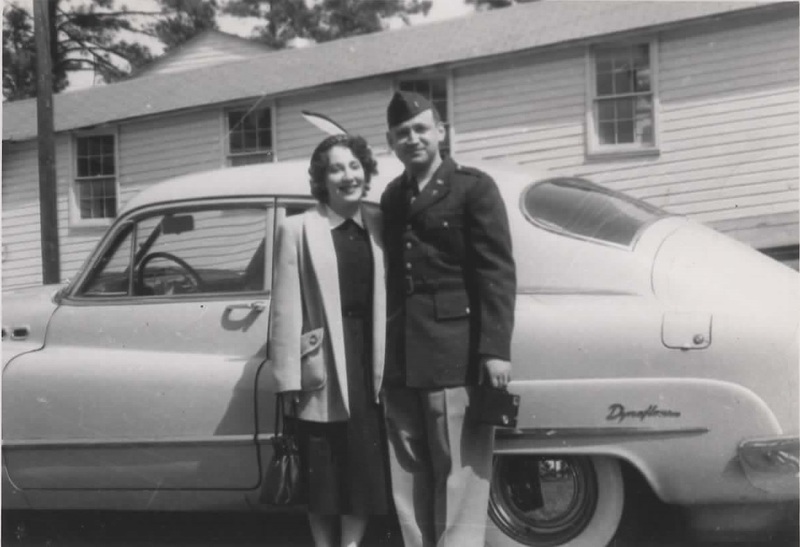 Sometimes I put myself in my grandmother’s position, imagining the fear and anxiety she must have felt with my grandfather away in Korea, not knowing if he’d return home. She spent a year and a half with the uncertainty, and the aftereffects are still with her today. Whenever my grandfather’s stint in Korea is brought up, she tells me and my mother how afraid she was that he wouldn’t make it back. If he hadn’t, she reminds us, neither of us would here today. Ruth and Sidney Goldstein in South Carolina. Sidney was stationed there before he went to Korea. Despite the small fraction of worry that invades when I read my grandfather’s letters, it’s usually hard for me to take the potential of danger seriously. For one thing, I already know he made it home safe. For another, as a medic he was never stationed in the frontlines. He also spent a good portion of his 1951 letters reassuring my grandmother that he was safe. Turns out he sometimes omitted things. Things like screams in the night, overturned jeeps, and rides through landmine territory with only the inky blackness of night to keep you company. Caught off guard by how close he came to death, for the first time I got a real sense of what my grandmother might have felt like when she read this letter for the first time. He tells my grandmother about these incidents months later as he’s on his way to the safety of his new station in Japan. He says he didn’t want to worry my grandmother while they were still in Korea, but I can’t help feeling a little deceived. He pledged to write honestly and in detail about his experiences, but I bet if I look back at his June, July and September 1951 entries (which I eventually plan to do) he won’t even hint at the real story. To be fair, my grandmother is a big worrier, so the omission was probably wise. But as a reader and granddaughter who believed he would tell the truth, I’m a little dismayed. Nonetheless, the passage below is one of my favorites. Much like Joan’s dreams, it’s full of suspense and danger, and offers a close look at the horrors of war. Though separated by time and different conflicts, their descriptions of war—in particular, that indefatigable need to flee and survive—are strikingly similar. Calm satisfaction and inner peace still pervade my being; I’m looking forward to unique and tasty meals in Japan with the same eagerness that we both experienced when we were on our honeymoon. 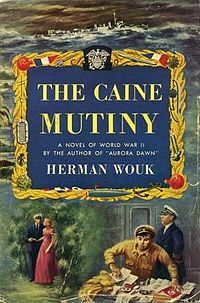 While on board this ship, I have already finished the book Caine Mutiny. First edition cover. It became a famous play and movie. Another roll of film to be developed and I now have color film in my camera primed and ready to go. Even though I have been on the high seas for only three days, the wonderful joys of civilization has made Korea a dim recollection. and the derailment of the railroad train were absolutely false. It’s true I did not tell you everything about Korea, but I did not want to worry you needlessly and make you gray ahead of your time. Let us turn back the calendar to June of 1951, the month of my grand debut in Korea. At that time there was still the danger of communists infiltrating our lines. They enjoyed attacking vulnerable spots that could not easily defend themselves such as medical installations. In fact, in the months of April and May, several doctors, medical aid men, and even chaplains, were killed during such sneak night raids. During my early days in Korea, I carried a gun and I wouldn’t have hesitated to use it either. I had the strange sensation that I would be shot in the head by an enemy sniper lurking in the bushes or the overhanging, perpetual hills which always surrounded us no matter where we rode or walked. In early July, several communist infiltrators were killed about two miles from our position, but some of them escaped. For an entire week we spent anxious, sleepless nights with our loaded guns within arm’s length. I’ll never forget one night; I posted my medics as guards around the aid station. At least ten times I could hear their determined voice shouting: “Halt, who goes there?” At about 3 am a shot suddenly rang out. I thought that was the beginning of the fireworks but no more shots were fired. The thousand and one noises we heard that night were interpreted as belonging to the Chinese guerrillas. With the coming of the light, we felt safe and secure. 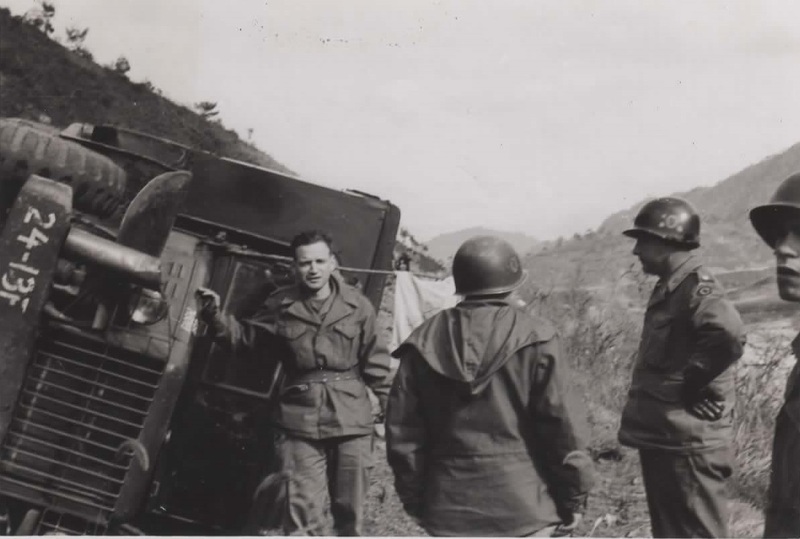 I later discovered that the shot that rang out in the night could be attributed to a nervous GI who shot at what he thought was a moving figure on the road. Oh, the blood-curdling scream! One of the cooks it seems was having a dream in which he was tied with ropes by the communists and they were about, to crush him with a steamroller. No wonder he awoke with a fearful scream! There was one other time I appreciated the saying “Let there be light.” Do you remember that 150 mile march I told you about? Well, I was wrong; it was only 26 miles. Do you remember telling me of reading about a company of our men who had been trapped by the communists? It so happens that my artillery battalion made that night march in order to come to their aid. 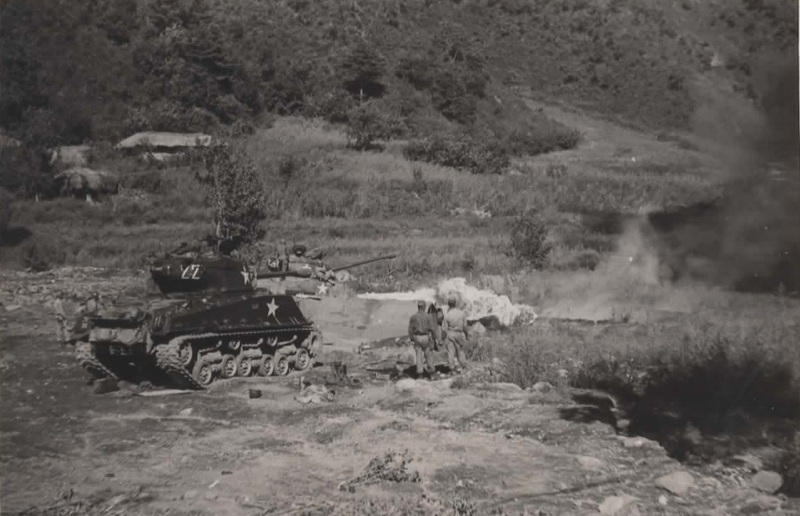 Sidney Goldstein captured this tank in action. The night of Sept. 18 was a nightmare I will never for­get. It was the first taste of blackout driving for my medics and me and we did ourselves proud. We all kept a sharp lookout for the road; after all we didn’t want to drive over a mountain pass. Suddenly my driver, Corporal Gehrs, and I saw white tape ahead of us and just to the side of the road. We instinctively stopped and drove around the white marker. We later learned that a white marker indicates that there is a minefield at that spot. At about 10 pm that same night, word reached us that one of our trucks had overturned while rounding a turn. I envisioned dead, crushed bodies and bleeding galore, but all I had to treat were contusions and painful shoulders. Then at 11:30 pm the medics were called again: in going off the road, a jeep had set off a booby trap. We weren’t told where the incident occurred. We drove everywhere in the darkness and couldn’t find a soul. In the meantime, about 1,000 yards ahead of us, we saw machine guns playing a deadly game and tracers and flairs lit up the sky. Why, heck, that was the fighting front. Eventually, we came to a fork in the road, and fearing that one of the roads might lead to communist territory, decided that a 50-50 gamble with our lives was not worth it. We retraced our steps instead. Fifteen minutes later we found the four victims of the booby trap explosion. They were all badly shaken, hurt and staring vacantly. 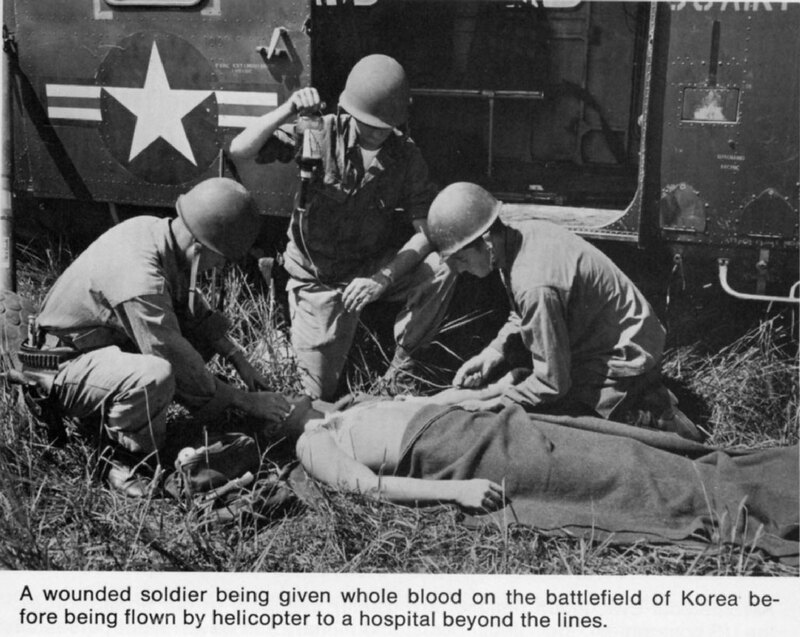 Medics helping wounded soldier during the Korean war. Photo and story here. With the above two incidents occurring in rapid succession, we had to break convoy and became totally lost. 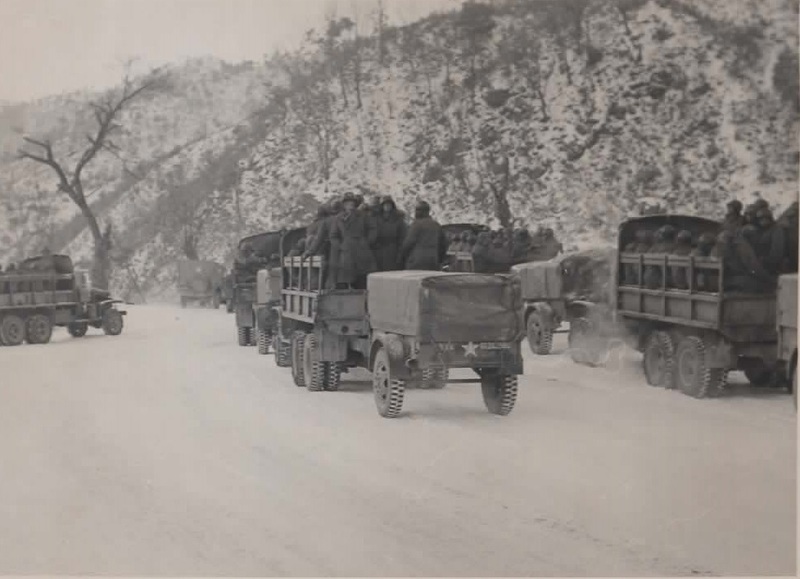 For a while, we found ourselves following the vehicles of an infantry outfit that was also part of the large convoy. We had the uneasy feeling that we were going to the front lines with the infantry. Soon dense silence engulfed us; we realized that once more we were all alone but had to keep moving. And so from 12 pm-5 am, we wandered through the deep darkness hearing machine gunfire in front of us and behind us with occasional flares lighting up the sky. We drove slowly, making sure we stuck to the hard asphalt road, wondering when the explosion from the minefields would occur. We were relieved that all we heard was the rumbling of our trucks and deafening silence. From then on we were in minefield territory. One of the fellows stepped on a booby trap a hundred yards away from my aid station and was blown into grotesque bits. This booby trap was located near a Korean hut. In fact, I wanted to take a picture of this hut with its thatched roof, but I decided against it for I knew that Christmas trees, houses and valuables lying on the ground were favorite places to plant booby traps. I instructed my medics most emphatically not to wander across the fields and to stick to the straight and well-trodden path or road. See this page for much more fascinating information about the Military Air Transportation Service. In our last position, a vehicle from an ordinance outfit drove across the fields to get to another road and set off not one but three mines (not booby traps this time). It completely demolished the jeep so that anyone could have lifted it with his hands. One fellow was killed outright, two died in my ambulance, and the fourth died the next day. So much about minefields, but I hope that Lt. Rack and his medics of the 40th Division take my advice about the minefields seriously. There are more war stories to tell, but that should wait for the breakfast table. Suffice it to say, what saved most of us was our alertness and common sense. Now don’t shudder, Beautiful. I am safe, sound, happy, very much alive, and love you terrifically with all my heart. 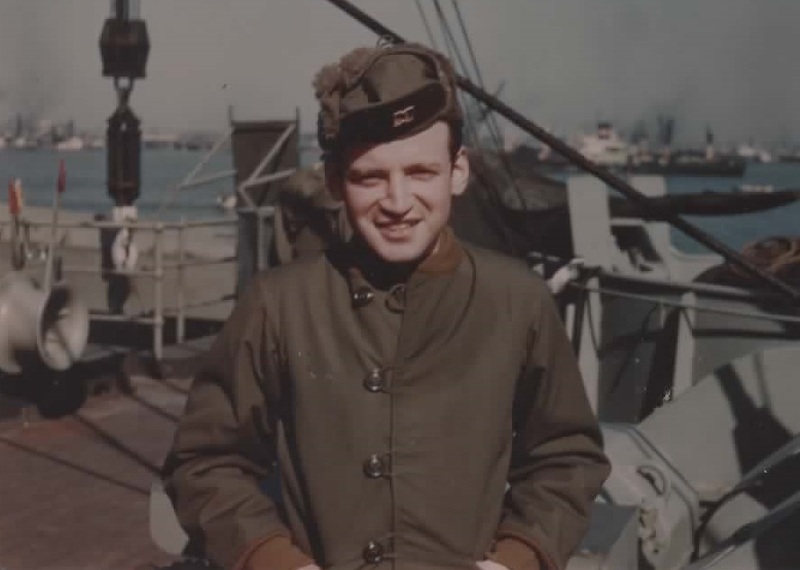 Sidney on board USS George Clymer, Jan ’52. Rachael and I hope you enjoyed this joint blogpost today! This Memorial Day weekend is a time to reflect on those who have given their lives in times of war. I have been reflecting on how young the soldiers were who fought. Hello! Do you realize it’s spring! Spring. 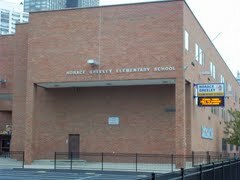 And the weather’s lovely (only it rained) and the air is sweet (sometimes) and the grass is green (in patches) and there isn’t a handsome boy in [Horace] Greeley [Elementary School]! It’s positively outrageous! And on top of that, there isn’t any R.O.T.C. unit in Greeley (they do look so handsome in uniforms!). When we went to the main building for the music festival, they were there in their uniforms and looked so gorgeous! And to top that, they’re even discussing doing away with the R.O.T.C. on account of putting war into [the] open minds (?) of the boys! Phooey, what about the uniforms, we don’t think about war. (Or do we?) Which all goes to show that spring is wrong . . .
A few weeks later, Joan still has R.O.T.C. on her mind. And those handsome uniforms (not to mention handsome boys!). Oh, I went down and saw them today at Soldier’s Field. Who? Why the R.O.T.C. boys in the annual review. Eight thousands troops there were—8,000—and probably 50,000 young folk in the audience. Mayor Kelly was there and oh—biggest news of all!—Lake View—Lake View—the school I’ll attend next year—won the first place along with St. Mel High School!! Isn’t that marvelous! About Lake View, I mean! My own school! 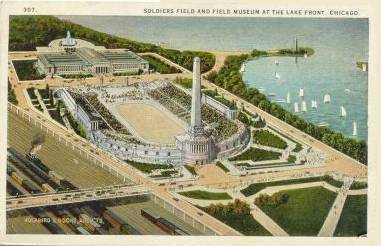 The review was at Soldier’s Field—a beautiful place, you know, open air—near the Lake—classical pillars on either side. It might have been a Roman forum or something. If there only had been some gladiators to be eaten by lions, it would have been a perfect Roman arena. The sky was threatening for a while and it even rained a few drops, but for the Grand Finale with all 8,000 troops in uniform the sun came up in glory to behold the sight of it. They all looked so tall and young and proud. It must be the pagan in me but when I saw all those boys so much like soldiers in their khaki uniforms and guns—and swords and solemn, eager faces—why, my heart just thrilled for the pure glory of them in the breaking sunlight. They all looked so bright and strong and fair and brave besides—well, I might have been Caesar himself so gladsome was I at the sight. And then Lake View was presented with her prized colors and the band burst into “The Star-Spangled Banner” and we stood up and shouted for our anthem, glad, and school. Isn’t that pretty—of course there were only 50,000, but what’s the difference? It’s pretty just the same . . .
Joan has a sunny disposition in these passages. ROTC seems to cheerful and fun. But soon enough, once almost a year has passed and Joan has become 15, her attitude changes.
. . . The United States (mine), England and France—the three great democracies as the paper glaringly puts it—sent a note to Japan last week demanding that she cut down on her navies—and yesterday the note came back with an answer—“Go to it—let’s have a naval race”—or to the point. And then Thursday night they had a program on the radio discussing the next war in confident tones. Somehow everything seems to point to 1940 as the turning point—as the time when the climax is reached. Everyone seems sure that there will be a war soon. I was talking to a boy in school Friday about war and death. He seemed sure that there’d be another war (another, oh!) and he said he’d probably be killed in it. All the boys I know will be old enough to die in a war in 1940. When I said, “And afterwards—?”, he said, “Well, if there’s anything to see—afterwards—I’ll see it, and if not, well, I won’t know about it.” Which is, after all, the only thing to say. But think 1940—death—war—oh, why must it be? Many of these boys Joan writes about have since passed away–either during WWII or due to natural causes after a long life. The WWII generation is fading from us. But those who are still alive can participate in a wonderful program called Honor Flight, which I first read about in the Austin-American Statesman in an article by Ken Herman. 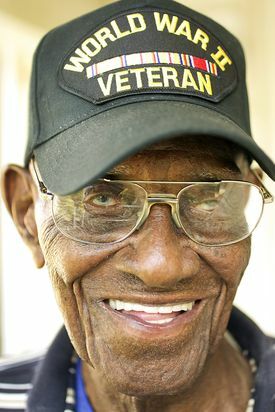 He writes about an amazing man: Richard Overton who is 107 years old. Yes, you read that correctly! “Mr. Overton’s World War II stories are typical for the greatest generationers who did so much for us and asked so little for it. He was in the Army. He served in the South Pacific. He landed, under fire, on too many beaches on too many islands for him to recall. 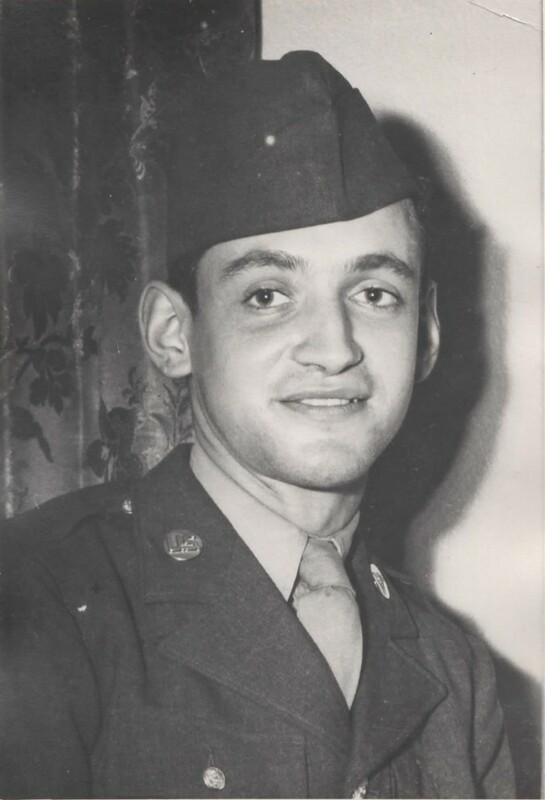 The records show he served from September 1942 until October 1945 and made stops in Hawaii, the Marshall Islands, Guam, Palau, Iwo Jima and Okinawa. Honor Flight is an non-profit organization that helps brings older veterans to Washington, D.C. to see and reflect on the memorials dedicated to them. The National World War II Memorial will be the sight Mr. Overton visited. Be sure to check out this video of Bob Dole speaking about the Honor Flight project, dedicated for helping elderly vets come to Washington, D.C. to be honored! Perhaps you will want to help support this wonderful organization! Posted in Susie's Blog and tagged bob dole, honor flight, Horace Greeley Elementary School, Lake View High School, R.O.T.C., richard overton, Soldier’s Field, The Star-Spangled Banner, ]. Bookmark the permalink. Home Front Girl has been named by the Children’s Book Committee at the Bank Street College of Education to the Best Children’s Book of the Year 2013 list for ages 14 and up! I’m so proud of my mom, Joan, whose diaries have been recognized in this way! 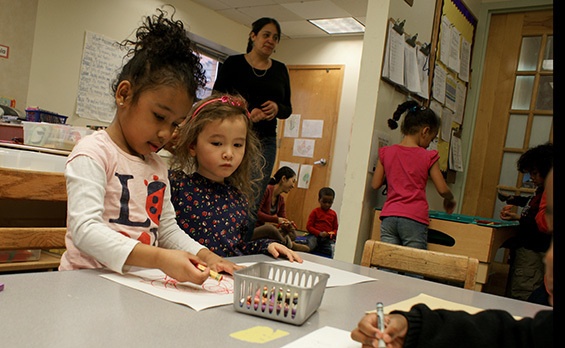 From the Bank Street College of Education; Preschoolers learn by interacting with their peers under the guidance of highly qualified teachers. I’m very excited! There is a magazine for those interested in World War II called America in WWII. This is the issue Joan’s diaries appear in. It has a subscription circulation of about 12,000 readers, which means even more people read it (library patrons, etc.). It retells and discovers stories from the past and makes them live today. You can download the excerpt with Joan’s reflections on Pearl Harbor and its aftermath here: AmericaInWWII. 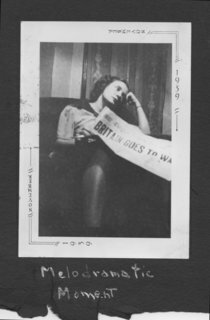 Joan with the newspaper the day Britain goes to war. The magazine has great resources, like this film of the B-17 Flying Fortresses. This page has many links to footage from the war. They even have a link on their site which allows you to listen to Big Band Music while you browse the site which has lots of important articles. There are fascinating back issues you can also buy. If you are interested in WWII, you will definitely want to subscribe to America in WWII, just as I have. You can do so by following this link. Happy reading! Posted in Susie's Blog and tagged America in WWII, b-17 Flying Fortress, clark gable, excerpt, magazine. Bookmark the permalink. Oh, the libraries I’ve taken shelter in — both physically and emotionally! Those who love to read learn to delve into the stacks of book-laden shelves in libraries at an early age. For many, the library is an oasis of salvation–where new worlds can be discovered, sometimes safer and more joyous than the quotidian one hovering about: boring, normal, menacing, or stressful. I’ve always associated many of the libraries I love with my mom. 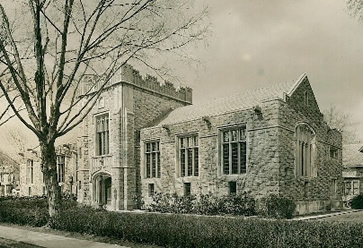 Happily, I’m scheduled to give a talk in my hometown library where I have spent many, many days, and where my mother, Joan, would pick me up after I had Girls’ Choir practice at St. Peter’s Church in Morristown, New Jersey. I’ll speak on Thursday October 10, 1:30-3:30 p.m. at The Morristown and Morris Township Public Library, Morristown, New Jersey–courtesy of the New Jersey Chapter of the National Society of Arts and Letters and its President, Judy Martorelli. This was also Joan’s library since she lived in Morristown for over 50 years! 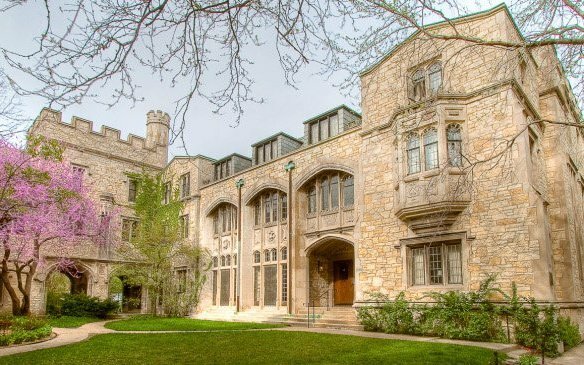 For Joan, in the 1930s and early 1940s when she wrote her diary, now published as Home Front Girl, the library plays a key role in Joan’s emotional and intellectual development. 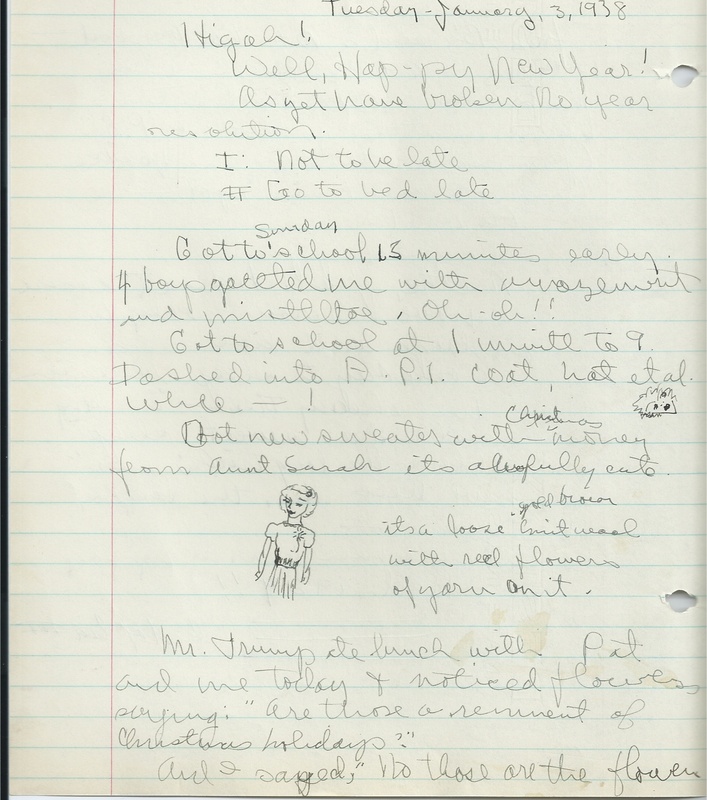 When she is 14 [May 29, 1937], Joan writes about how she walked downtown to the Art Institute in Chicago–and back! Over 8 miles. And hearts undaunted sing again. Isn’t that a lovely thought—“hearts undaunted sing again”—though ever the years are long and hard—the Spring will always come and our hearts can sing again—oh how beautiful!!! From Kipling’s “Merrow Down”; Joan changes “unwounded” to “undaunted.” You can read it here. 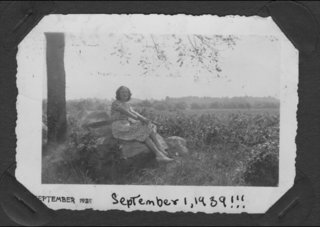 In January 1938, when she has just turned 15, Joan reads the Nibelungenlied: “[A]lmost two months it took, and I owed 33¢ at the library by the time I had finished, but now I’ve read one book very few people I know have read—which is something.” I have not owed as little as 33 cents for years! A few months later, Joan visits “Lewis Institute Library. Saw historic doors where Mom and Dad met—(oh evil day!) . . .” Ha ha! While it is true her parents did not have the best of relationships, Joan was the product of their union — and all thanks to a library! 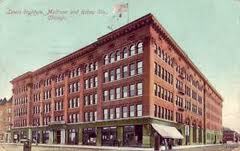 It eventually became part of Illinois Institute of Technology. 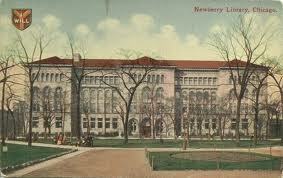 Another library plays a role in her life: the famous Newberry Library.
. . . Sunday night Daddy and I went to Bughouse Square. Not many talkers there and those not as good as they could have been. One of them was talking anti-everything and while he talked, I saw Venus shining over his shoulder. They say she is blue, but that night she was quite golden. And the man talked, sharply silhouetted against the street lamp, standing on his soapbox, the crowd like some dark elemental mass crowded below him and the great golden orb of Venus over his shoulder. 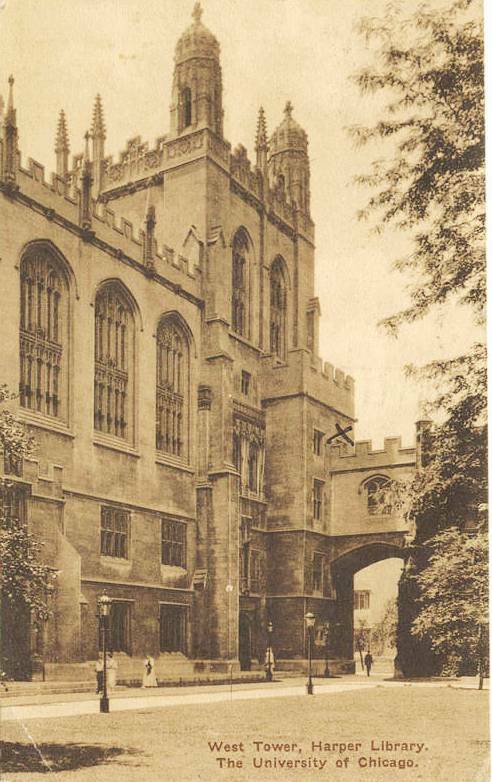 The church spire in the East pierced the sky like a black rapier and the Newberry Library was a gloomy disapproving bulb in the night. It was a picture to take with you, unreal with the insects buzzing in the light and the trees moving like shadows in the warm night. Rain fell for a minute like a canvas over an unreal picture. Grant that I may know more unreal nights like that, when one can half-close one’s eyes and seem not to exist at all save as a watcher. A nickname for Washington Square Park. Anyone could speak to crowds there, generally on soap boxes. Joan writes about how June 12th has always meant something to her. …You know, June 12 is a sort of anniversary for me. Three years ago the Jolies Amies (remember them—us) gave the great production of Naughty Marietta. 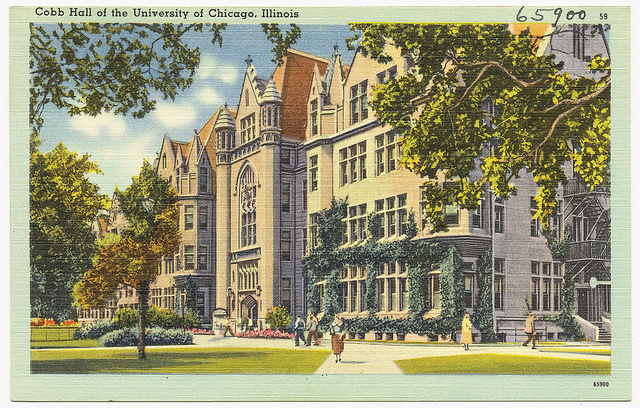 Here’s a library card belonging to Gloria Gumbinger for the Chicago Public Library. 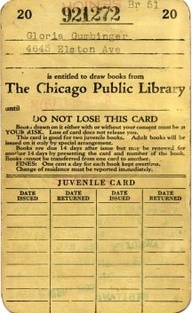 Notice how it says “Juvenile Card.” Courtesy of http://pinterest.com/alefkovi/chicago-and-london/. Two years ago today I graduated. A year ago today I got my orange library card saying “Adult” on it. So each year June 12 has meant something to me. But libraries do not always have such a happy appearance in Joan’s life. 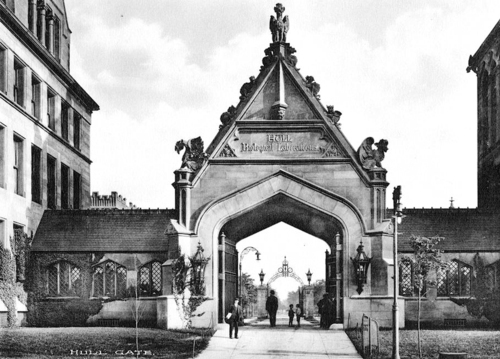 Shortly after World War II began, when she is almost 17, Joan visits a library near Lake Michigan on the south side of Chicago. It was the day after we repealed the arms embargo. 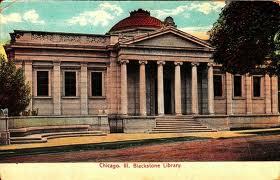 I had gone to the Blackstone library to exchange a few books. With the Wild Swans at Coole in my hand I walked up to the great globe that stands in the window. Ferns stood about on the floor in great pots. I turned the globe to Europe and noted that the ocean was grey-green, not blue as in the newer terrispheres. Europe fell crosswise under my fingers and, tip-toeing, I traced the worldly boundaries. I could see France and Germany on either side of the line and realized that my finger was placed on the tingling western front. That was the border when Caesar wrote his Commentaries. 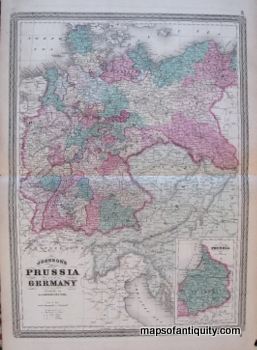 My eyes went upward and I saw in black letters—“Prussia”—this must be an old globe, I thought. 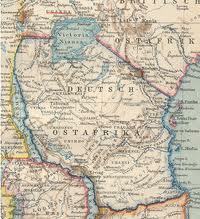 Then I saw “Austro-Hungarian Monarchy.” There is a name I have not seen upon a map before. I was born after the redivision of 1921. They are beginning to turn out the lights in the library. Reflected in the window, I could see the interior of the room. The great globe, the tall ferns, the man reading, the shelves of books, myself on tiptoe. A sort of realization of changelessness pierces me. I am magnetized by the globe, I cannot draw my hand from the Danube. I seem to see a million people standing on the shining terrisphere, shouting to me that nothing changes. All the people who ever lived are telling me. Black specks on the globe. We have just repealed the arms embargo. Of course we have—nothing ever changes. I draw my hand from the globe and it turns slowly. I watch it in the window. I check my books and walk out between the pillars. The light from the street lamp slants through them. In the windless air, I can feel the stagnation of eternity. I can hear my footsteps beneath me and see the dry red leaves on the ground. A dog barks as I turn in at my door. I was sitting on the little table there and had my gold sweater on that matches my eyes. My hair was swirled up and my bangs were soft and fluffy. He came over and leaned on the table beside me. “How are you?” he asked. My heart was pounding like African tom-toms and I was sure he could hear it. It was hitting the side of my chest with tremendous force. It seemed like everyone in the room must be watching us because of our dramatic greeting. His eyes were brown today. . . . You know, after that night on the roof this was the way I imagined we’d meet some day. . . . In Harpers, suddenly, “Larry . . . Joan.” Of course, since then there’s been our social drama interlude and all . . . 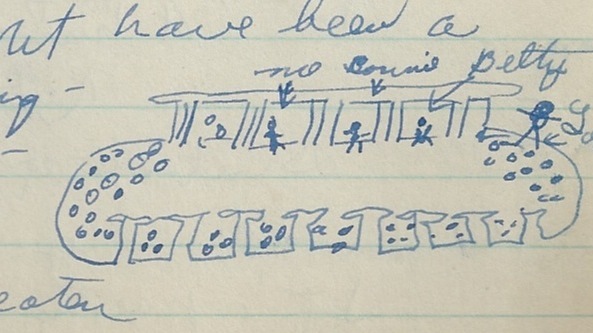 This passage from January 3, 1939 shows Joan’s doodle of the sweater she describes in the passage. Anyhow Betty saw me peering up over my German and said, “What are you looking at” and I babbled on and she almost died. Everyone in the library must have noticed. And then he came back. Betty and I were together and he nodded and went on. Would it have been different if I were alone? Of course not. Oh, Joan. Stop being foolish. He went down the stairs with someone else and kept turning his head to look back, Betty told me, till she thought he’d fall down. I couldn’t look. Then we ran into the monk’s place to watch him—running into the little one on the way. . . . I collapsed and sighed and wheezed away. We reenacted it the way you do, you know. We really enter into things. . .
A few months later, she has another romantic trauma–this time with a boy named Hugh. Arrived at Cobb and went upstairs to return Hitler and Hume. Was just dumping them into the slot … when I heard a voice, “Let me put it in the slot for you, little girl.” And a bony hand reached over and grabbed Hume. I almost collapsed and began to giggle. What had he been running for? He seemed rather silly and expecting me to go into the library, but I turned around and departed to Sociology, leaving him still panting from his run, his Adam’s apple wiggling up and down. Well, it was good for his health—his hump. They had to read a translation of Mein Kampf for a class. David Hume, the 18th-century Scottish Enlightenment philosopher and historian. A short while later, Joan goes to a different library. Aside from Plato, I’ve been studying pretty well these last two days . . . in Divinity [Library] too! I feel there’s less distraction there, which is no lie. . . . It’s rather pleasant there too. These last days have been so hot and to sit in the cool, high-ceiling room with the wooden painted angels on the rafters and the heavy curtains blowing with the hot wind is quite pleasant. . . . The floor is tile and, looking out the narrow, many-paned open windows at the exotic-looking locust trees outside, one can almost imagine he is in Egypt, or some such faraway place. The trees, with their tiny leaves on the long fronds might indeed grow under the sea, they are so foreign in appearance. The blue sky, the grey stone and the green trees, it makes a pretty picture as one looks out. Indeed, it might be a panel on the wall. As you can see, even in Divinity Library I get distracted. . .
It’s almost the time of Pearl Harbor. But not yet. Beauty can still infuse Joan’s world. Blue Monday, it rained, etc. . . . Maroon newspaper meeting, class at hospital. To Cobb [Library] in the downpour to study. All the sudden, I looked up and everyone was looking up. . . . It had cleared, suddenly miraculously, a brilliant sky lay before us purple and blue and all lovely colours. The green leaves hung on the trees alight with diamond raindrops and the yellow and red elm leaves burnt into the eyes. . . . The very grey stone of the buildings seemed alive with colour. And all this we saw through the rain-sequined windowpanes of Cobb. Beauty just about kills you sometimes. Then I went back to my Phy Sci problems. 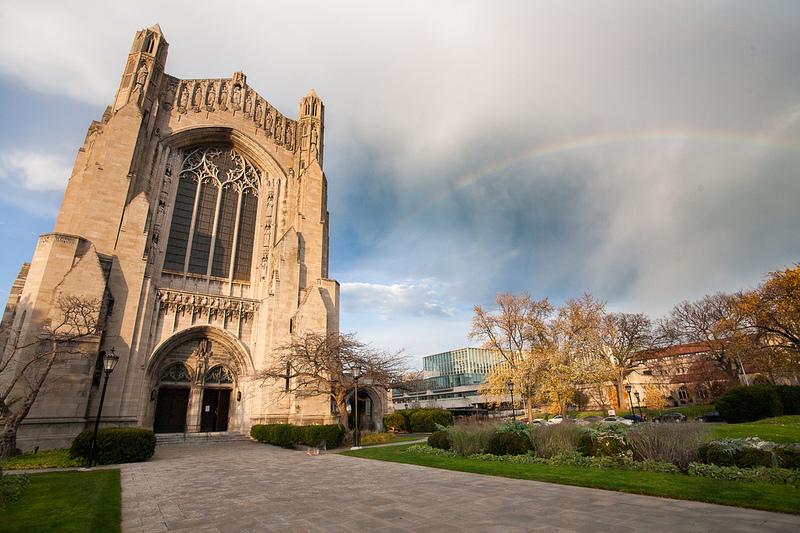 Rainbow over Rockefeller Chapel on the University of Chicago campus. Joan and Bob were married there on June 19, 1943. Once the war begins, a library provides a kind of security–there life continues as before. 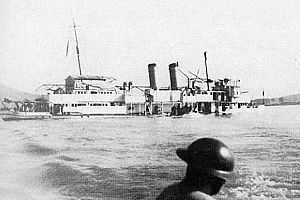 The Jap paratroops have captured Luzon in the Philippines and sunk two British ships, the Repulse and another near Singapore. Hitler speaks to Reichstag tomorrow. We just heard the first casualty lists over the radio. . . . Lots of boys from Michigan and Illinois. Oh my God! . . .
Life goes on though. We read our books in the library and eat lunch, bridge, etc. Phy Sci and Calculus. Darn Descartes. Reading Walt Whitman now. Morristown and Morris Township Library about 100 years ago. 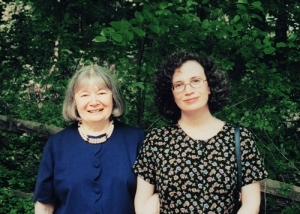 I’ll be thinking of my mom as I give my talk of her book in the library she and I so often went –where we discovered new worlds together. 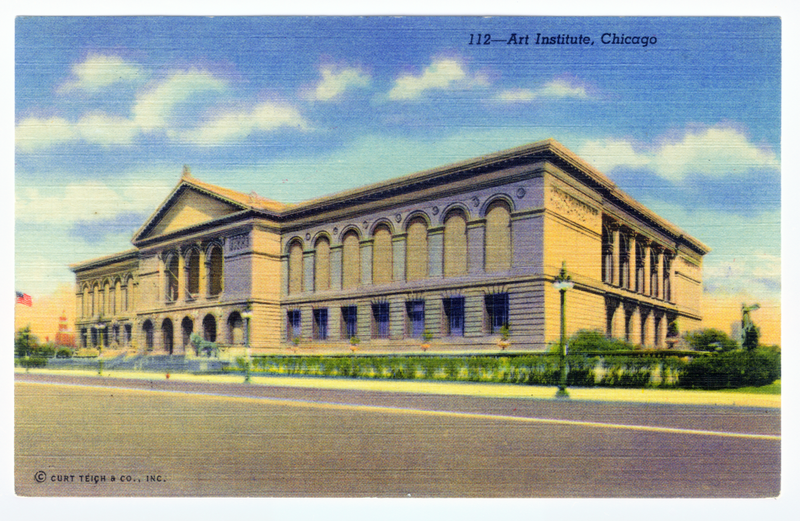 Posted in Susie's Blog and tagged Art Institute in Chicago, Blackstone library, Bughouse Square, Cobb Hall, Descartes, Disciples Divinity House, Harper Library, Hitler, hume, Illinois Institute of Technology, Joan, Kipling, Lewis Institute, libraries, library, Maroon, Merrow Down, Morristown, Naughty Marietta, New Jersey, New Jersey Chapter of the National Society of Arts and Letters, Newberry Library, Nibelungenlied, Pearl Harbor, Susie, The Morristown and Morris Township Public Library, university of chicago, Walt Whitman, Wild Swans at Coole. Bookmark the permalink. I’ve written elsewhere on this website about my amazing 8th grade English teacher, Nancy Castellano. She taught me at Frelinghuysen Junior High (now Middle School) in my hometown of Morristown, New Jersey. I remember reading Les Miserables (an abridged version–the original is 5 volumes long) by Victor Hugo with her! If you would like to read the entire novel, click here. Below is the famous image of Cosette from Les Miserables by Emile Bayard from the first edition. The original image of Cosette from Victor Hugo’s Les Miserables. The image is by Emile Bayard. I’ve also written about the current exhibit at the New York Historical Society on World War II & NYC. Well, it turns out the museum organizers interviewed Nancy about her time in the WAVES and about her book. And she “appears” in the exhibit at a kiosk with a video of her talking about her time in the WAVES. In fact, the second part of Section 3 of the exhibit, is all about the WAVES. Here is a photo of WAVES marching at Lehman College. [WAVES marching]. Courtesy of Lehman College, CUNY. Special Collections, Leonard Lief Library (Bronx, New York). Here is a video of Nancy telling about her experiences with the WAVES! Thank you, Nancy, for your service to our country! It’s so important that you’ve shared this experience with those of us who were not alive during World War II. 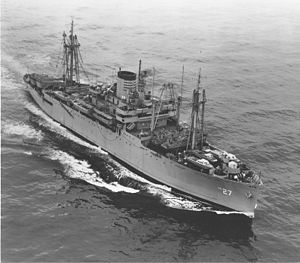 And, for another neat story about a WAVE and her romance, visit this site about the USS Thomas Stone. Posted in Susie's Blog and tagged cosette, emile bayard, Frelinghuysen School, Lehmen College, les miserables, Morristown New Jersey, Nancy Castellano, New York Historical Society, USS Thomas Stone, victor hugo, WAVES, World War II & NYC.. Bookmark the permalink. I just came across a wonderful resource with LOTS of information about World War II, including primary material and documents. It is the Social Studies and History Teacher’s Blog. They even have a section on the World War II Homefront. Of the fascinating movies they include, I like this one. It’s about an African American farmer, Henry Browne, who is a peanut farmer in Georgia. The film extols farmers and their work. In this case, Mr. Browne’s plow is pulled by two mules on his 40 acres. Mrs. Browne has a garden. They’ll can things for those who live in cities who cannot grow their own vegetables. Mr. Browne’s planting of peanuts along curves of the hill prevents erosion–and the narrator praises him for this, reminding the listener that we have to save our land and resources “for the duration” (the length of the war). The film seems to promote the unity of all Americans — of all races (no mention is made of discrimination), genders (both the parents and the all children–male and female–contribute) and rural and urban inhabitants. The exciting ending shows the family visiting the oldest brother–who is a a member of the 99th Flying Squadron, the first flying unit for African Americans. They became known as the Tuskegee Airmen! 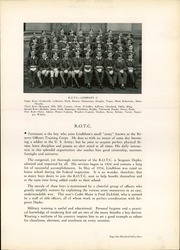 Posted in Susie's Blog and tagged 99th Flying Squadron, African American, farmer, Henry Browne Farmer 1942, race, Social Studies and History Teacher's Blog, Tuskegee Airmen. Bookmark the permalink.